Tonight is my last night at sea. The trades have been very steady, around 20 knots with some squalls up to 30 knots. I have just the mainsail up and trucking along, the boat and autopilot have been dealing with it pretty good. It has given me some time to recover and fix some things. I got my solar charging at a sufficient rate after I lost one panel. I had to rewire a controller back to the battery. I have also had time to read “Not a yacht club”, which is a great book and I am very proud to be part of the SSS. I also found time to read “Experiment in Survival”, an interesting book. Seems like a lot of trouble for a publicity stunt. I am really excited to get to Hawaii and see everyone and start eating again! I’m really looking forward to tree time. Looking back at the trip, I was expecting to say the hardest part of it was leaving, but I can’t say that. There have been some very challenging, emotionally and physically, times over the last 2 weeks. Overall I am really happy with the boat and how it performed. The biggest thing I would change is to bring a whisker pole. Not having one really reduced my miles in these conditions leaving me to be under a main more than I would like. With the heavier conditions, it was too risky for my to fly a spinnaker. 20 knots was my limit. I was expecting to do a lot more spinnaker work, but it didn’t allow for it. I also expected it to be a lot warmer. It really didn’t get warm until 4 days ago. I am happy with how dry my boat has been, the bilge hasn’t even filled up once! Thanks to the dodger, and new hatches and all the work I put into sealing all the holes. It sure makes a big difference psychologically having a dry place to go to and sleep. I am happy with my autopilots and electrical system. Everything ran perfectly and I had plenty of power. Next time I would bring more fleece pants and long underwear. I also would provision a little more differently too. The same meal gets pretty boring and then I don’t want to eat. I spent today cleaning up the boat and packing bags that go ashore so I can just anchor and head to the beach. It will be a dream come true tomorrow, hopefully the squalls won’t be too bad tonight. 2 days ago I came across a group of dolphins, there must have been hundreds of them. They would swim along the boat and jump right in front of it, kind of playing with it. This went on for about a half hour, sailing along with all these dolphins in the middle of the sea, it was a very unique experience I won’t ever forget. Reminds me of a time I was working on a ranch that borders Yellowstone National Park, and after a long day of fixing fence up in a high mountain pasture, I was riding home across a hay field and came across a herd of 400 elk. Next thing you know I was loping my horse in the middle of this herd of elk across a field. There was nothing like that in the world. Purely living in the moment. Well, that’s all for now, gotta get things set up for night squall sailing! The past couple days have been very trying. Monday the seaway was starting to build, I was making my way down after a short night sleep due to little squalls all night that kept the wind shifting so I had to constantly trim sails and change course all night. Monday afternoon my rudder started to shake pretty bad. Wind was in the 20’s with 8’ seas. I was really hoping it wasn’t major, I wouldn’t know what to do if it was in those conditions. I replaced the bearings and the rudder is brand new, so I was just hoping seaweed or something. So I took the headsail down and faced into the wind a couple times. The great thing about Olson 30’s is that their rudder turns 360 degrees. So after spinning it, whatever was down there freed up and came off. Tuesday the seas were the same but a cross swell started in the afternoon. When one of the big main swells met one of big cross swells, the main swell picked up the boat like it usually does, but the cross swell hit at the same time flipping the boat on its side pretty violently. Immediately the boat was knocked over and it catapulted me out of the cockpit and I landed in the water by the boom. I grabbed on to whatever I could and crawled back into the cockpit before the boat came back up. Luckily I was wing on wing with no pole, so when the boat came back up, it was naturally hove to. Quick report was a damaged solar panel and looking on the horizon was a big squall that was causing the cross swells. I only had time to repack my life jacket and get back on deck to secure the panel and get ready for the squall. I ended up cutting the wires to the one panel even though it was tied to the second panel, and I’m glad I did because a little bit later another wave took the whole panel. It would have ripped out the wires to the other one and left me with no panels on the back. I spent that whole night soaking wet, sitting backwards in the cockpit steering according to the waves. Wind was at least 40 knots. It was squall after squall for at least 12 hours. I did not take my eye off the sea at all and doubled up on tethers. Without enough charging capabilities with one panel, I hand steered all Day yesterday and last night as well as looking out for squalls. Today I was able to rewire a spare panel and charge controller to the battery and is charging pretty decent with plenty of sun. I also fixed a couple other boat things. I had a chance today to rest for a couple hours and cleanup from the knock down. 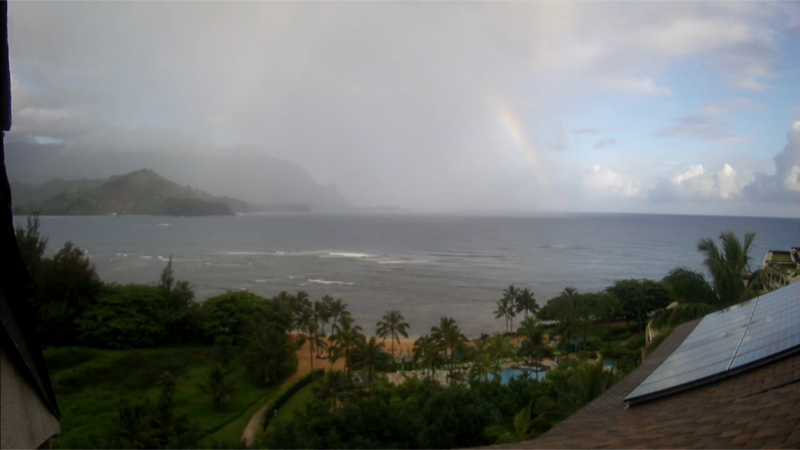 Looks like 3 more days till Hanalei, looking forward to getting there.